One Long Decade: Can the ACC Ever Return to the National Stage? It has been one very long decade of national silence for the Atlantic Coast Conference. After Florida State reached the first three BCS Championship Bowl games, the conference has failed to place a single team in the season’s biggest game. In 2004, the conference announced the additions of Virginia Tech, and Miami from the Big East. The following season the conference plucked Boston College from up north giving the ACC the required 12 teams to play a conference championship game. These three programs brought prestige, and instant rivalry games to the national landscape. 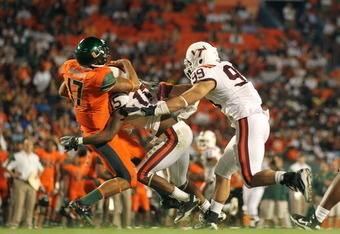 The Eagles gave the conference extended exposure in the northeast, and both Miami and Virginia Tech were natural geographical fits. The Hurricanes reached the national championship game during the 2000 and 2001 seasons. Led by Michael Vick, the Hokies played Florida State in the second ever BCS National Championship game. Since the league expanded to 12 members in 2005, only Florida State, Virginia Tech, Wake Forest and Georgia Tech have claimed the leagues automatic BCS bowl berths. With the current conference structure, many around the nation felt the ACC would rival the power of the Big 12, Big Ten, Pac-10 and SEC. Since the proud Seminole dynasty fell back to earth early in the millennium, the league has yet to provide a serious BCS title contender. Virginia Tech has been the only team to consistently battle for a conference championship since arriving in 2004. After producing many of the most talented teams in recent history, the Hurricanes have battled inconsistency and unreached expectations since joining the ACC. Historically one of the biggest rivalries in the nation, the Hurricanes and Seminoles now rarely square off in the national spotlight. This year’s final BCS rankings place show Virginia Tech at 13th, and Florida State at 23rd. For a conference with 12 members and a fertile recruiting base, one would expect more. Despite a stockpile of talented players, Clemson and North Carolina have yet to put together conference title runs. North Carolina State, Virginia, Georgia Tech and Boston College are no more then one-year or two-year wonders. The bottom of the league is where you can usually find Duke, Wake Forest and Maryland. 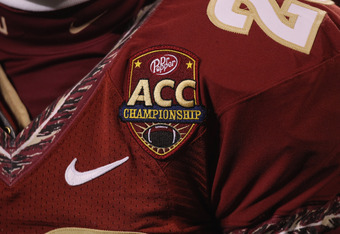 Possibly the ACC was better off with out Miami, Virginia Tech and Boston College. Is a 12 member league with a conference championship too difficult to provide a quality undefeated or one-loss team? The past decade has seen regular season undefeated squads from ever other BCS automatic-qualifying conference. In the short-term, things don’t look good for the glory of the ACC. Not a single program in the conference is poised to nurture and blend their talented rosters into the confidence to make a run for a BCS championship. ~ by philip d. on December 20, 2010. This entry was posted on December 20, 2010 at 2:17 pm and is filed under Boston College Golden Eagles, Clemson Tigers, Florida State Seminoles, Georgia Tech Yellow Jackets, Miami Hurricanes, NCAA Football, North Carolina Tar Heels, Virginia Cavaliers, Virginia Tech Hokies.You can follow any responses to this entry through the RSS 2.0 feed.You can leave a response, or trackback from your own site.